We’re getting ready to head out for spring break for a few days. I’m pretty sure the tulip magnolia in the front yard is going to bloom while we’re away. It would be nice to come home to spring, considering the forecast has us driving through snow on our way south today. (!!) After all the snow we’ve gotten while this poor tree has tried to bloom over the last few weeks, we were pretty sure the pink gloriousness had been squished. 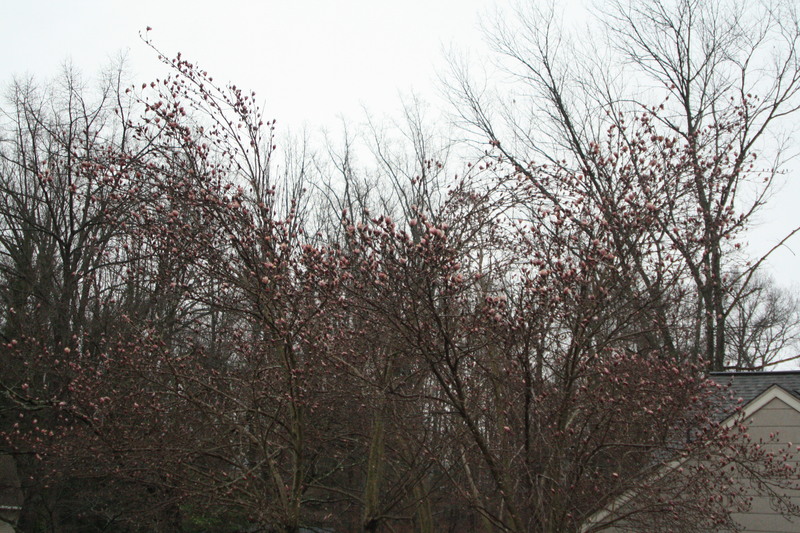 We noticed in the rain yesterday that while there are some brown spots on some of the buds, overall the tree appears pink! 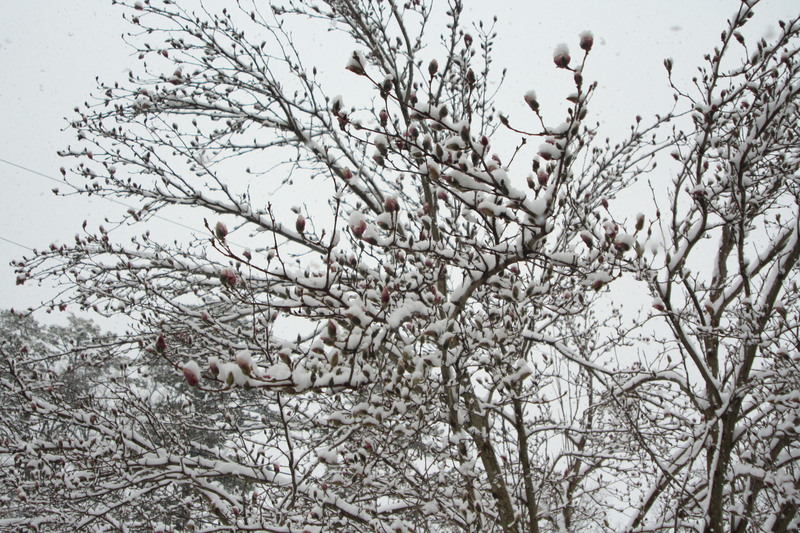 This tree, while the earliest to bloom every spring, is quite susceptible to the weather. It can quickly turn brown from a heavy frost or late snowfall. We’re not totally out of the woods yet with this tree, but it’s not as bad as we thought it was going to be on Wednesday after the latest 6 inches melted. In other news, I am sharing a garden plot with my friend Virginia in the community gardens behind the English Inn. I still can’t quite wrap my head around how much space I’m going to have to plant veggies. The back corner alone is probably twice the size of my current plot in the yard. I hear there are issues with rabbits. That’s fine. I know Virginia has harvested tomatoes down there and honestly, that’s why I want this secondary location. I’m just done planting tomatoes only for the squirrels to eat them all. Not planting tomatoes is not an option – I’ve been growing tomatoes most of my life – when I was a kid & my mother would let me have a spot in her garden, I always had tomatoes. Tomatoes were what started me on this whole kick to know exactly where my food comes from. Preserving the tomatoes in my garden was why I learned to can. I’ve long wanted to either expand our plot or get myself one of these plots so that I can plant more tomatoes and have the space to properly rotate my garden. This became available & is far, far less expensive than my long standing plan to make the side yard of our house a terraced vegetable garden. I spent some time last weekend working at my new plot. In wanting to make it rabbit proof, the existing fencing needs to be shored up. I discovered that at some point in time, someone had put a layer of chicken wire over the fencing, but it was no longer flush. Weeds had sprung up between the two. 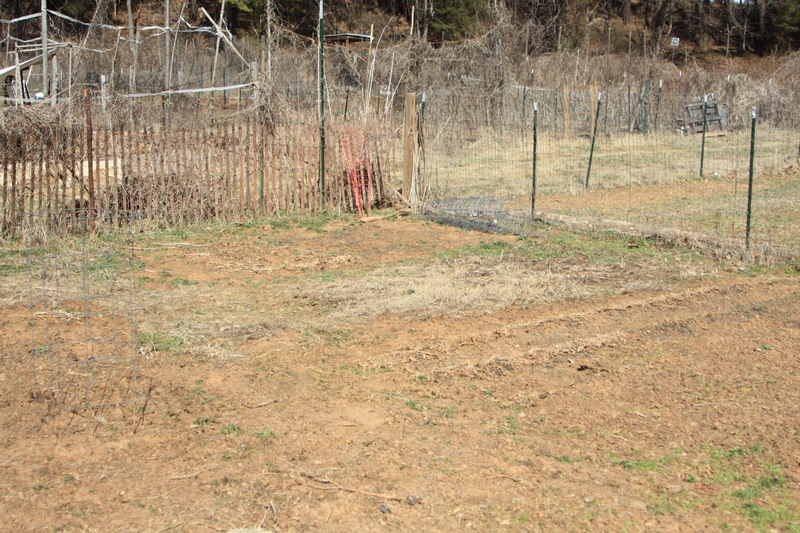 It took wire cutters and garden clippers to get everything cleared out of there, but the perimeter looks much better. As I was chopping away, I noticed what I suspected to be poison ivy. There were no leaves on anything, but at the bottom of some stems were those red, hairy roots. I took precaution, but given that I look at poison ivy & catch it, well, I was doomed. It started out okay at first – two small quarter sized patches on my left wrist. However, due to a habit of scratching my arms in my sleep (Pat does a fabulous imitation of this), I woke up one morning to discover I’d scratched the poison ivy open and had managed to spread it all over. It looks pretty gross. I can happily report it finally appears to have dried up, but it dried up my skin as well, so now I’m itchy from that. Sigh. It’s always something, isn’t it? In other weirdness of the overlapping of winter into spring, I seemed to have sunburned my lips while our walking in the snow the other day. Pat says it must have been the reflection of the snow that did it. So while the calendar page is about to turn to April, I’m getting sunburn & poison ivy, there is STILL snow in the forecast. Enough with this winter that just won’t end. I’m driving south until I hit some spring. Ugh. I know the feeling. We’re having a beautifully warm day here, and I walked around the garden to see a few little green tips (and snowdrops), but it’s supposed to be in the low 40s all week again. Sigh. I think poison ivy where you’re growing a garden is a really bad idea, and might be worth using some round-up to get it good and gone. Especially if you only have to look at it to break out in hives! It’s on the outside of the fence- it will be okay. My current plot was nothing but poison ivy 15 years ago. I had constant poison ivy from March through October the first few years we owned the house. The turning point was ripping the main root out of the ground. I got a steroid shot that time the rash was so bad. I didn’t know there was a community garden behind the English Inn! Have fun in Alabama! It must be lovely there, this time of year. 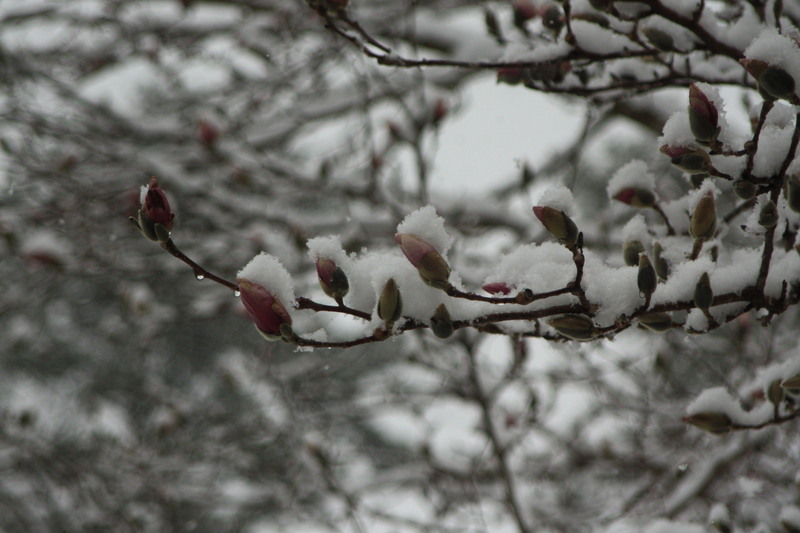 It’s warmer, with more hints of spring, but still no leaves on trees or dogwoods in bloom. That is a crazy spring for you–how unlucky can you get? Poison ivy? Because I got it while gardening (! ), I wear it as a badge of honor.